The 18th Annual Juried Student Exhibition at Silvermine Galleries returns July 27 through August 21, 2008. This is a much anticipated and popular event at Silvermine as students of all ages from the School of Art exhibit their work. All are welcome to the opening reception and awards ceremony to be held on Sunday, July 27th from 2pm to 4pm. Awards are presented in the Adult Category as well as the Youth Category for students through the age of 17. Entry to the juried exhibition is open to all Silvermine School of Art students who have completed an instruction course or Art Camp since January of 2006. Media submitted ranges from painting, to drawing, ceramics, collage, digital imaging, jewelry, mixed media, photography, printmaking, sculpture and silversmithing. This yearâ€™s juror is Nicholas Halko, Professor of Art as well as the founder and coordinator of the Studio Arts/Graphic Design degree program at Gateway Community College in New Haven. With a Master of Fine Arts from the Hartford Art School/University of Hartford, Mr. Halko has exhibited in solo and group exhibitions primarily in the Connecticut and New York areas. He has had exhibitions at First Street Gallery in New York City, the Slater Memorial Museum in Norwich, Connecticut and at the Silvermine Galleries in New Canaan. His works are also included in both private collections and public collections in the U.S and abroad such as the Parsonâ€™s Center in Milford, CT, and the City of Leon in Nicaragua. The Silvermine School of Art is a community based non-profit organization that fosters, promotes, and encourages artistic and educational endeavors. Courses and workshops are available throughout the year and are designed for full and part-time students of all ages and levels, from beginners to professional artists. In addition to the adult program, the school features courses for junior and youth, Summer Art Camp, and classes for young children and parents to experience art together. Many of the faculty members of the School are Silvermine Guild Artist members, and former as well as current students have also been elected to membership to the Guild. For more information please call 203-966-9700 ext. 2 or visit the website at www.silvermineart.org. Grounded in the belief that art is vital to the spirit, creativity and wholeness of human beings, the mission of Silvermine Guild Arts Center is to cultivate, promote and encourage growth through the arts; to showcase and serve artists; and to foster arts education and appreciation opportunities for the greater community. Silvermine Galleries are open Tuesday through Saturday, 11 a.m. to 5 p.m. and Sunday from 1pm to 5 p.m. For more information, call (203) 966-9700 or visit the website: www.silvermineart.org. BRIDGEPORT, CT - World renown photographer Steve McCurry generously donated one of his favorite photographs to the Housatonic Museum of Art. 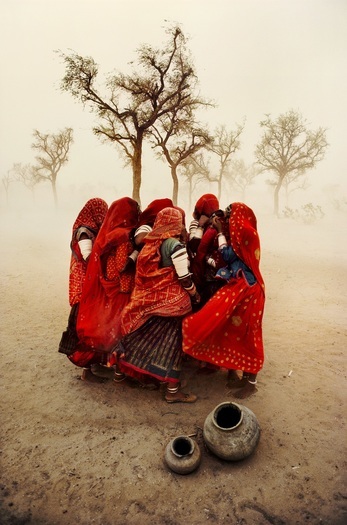 The piece, which was part of the museum’s recent exhibition, Steve McCurry: India, is named ‘Dust Storm.’ The photograph depicts a group of women huddling together during a sudden dust storm, protecting themselves against blowing wind and sand. Taken in Rajasthan, India in 1983, the picture appears in his book, Steve McCurry: The Iconic Photographs, which gathers many of his most beautiful photographs from around the globe. One of today’s finest photojournalists and editorial photographers, Steve McCurry captures moments of life that simultaneously connect us and offer windows to the world. Best known for his iconic ‘Afghan Girl’ image that graced the cover of National Geographic over 30 years ago, McCurry has won scores of prestigious photography awards, and has over a dozen books, and countless exhibitions around the world to his name.